Do you love modern design and ocean views? Then pack your bags and book a stay at NEO Villa! This ultra-contemporary villa has tons of glass and windows, so you can stare at the sea from any room. Plus, it boasts the island’s largest pool, so you can swim in privacy and gaze at the view all day. Get down to the beach in minutes, as Saint Jean Bay is only a short drive from the villa. Panoramic views of St. Jean Beach!! 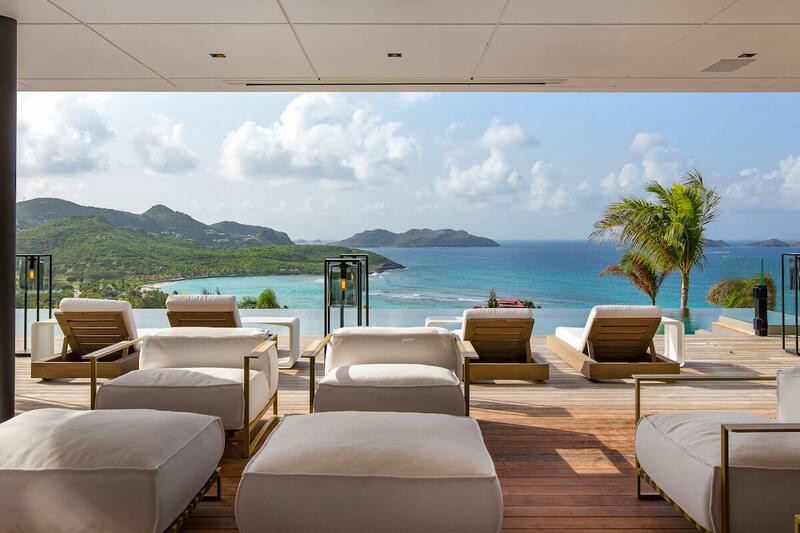 NEO Villa is a glamorously modern villa on the St. Jean hillside, offering the largest pool on the island and panoramic views. Local architect Patrick Raffeneau built the villa with large glass surfaces, extensive views, and tons of space spread throughout the home’s two levels. NEO’s most notable feature is its 108 ft. heated infinity pool, which is as impressive as the views beyond. It’s the largest pool on the island, with a Jacuzzi that cascades into the pool. Guests can grab a drink from the outdoor bar below and enjoy it on the extensive deck, which comes with plenty of seating and lounge chairs. Despite its massive size, the deck feels private and peaceful. Surrounded by two-level glass on both sides, the living and dining area gives guests plenty of room to lounge or eat while taking in the views. Next to the living area is the TV room, with a top-of-the-line entertainment system that can be fully isolated from the rest of the home. There is also a small gym for exercising and a hammam for relaxing. The entire villa enjoys central air-conditioning, and guests can use the home’s elevator to travel between the two levels. Daily housekeeping ensures guests feel pampered and relaxed in paradise. Three of NEO’s bedrooms are on its main level. The gracious Master Suite is situated behind the TV room, and has a separate sitting area that opens to the pool and deck. The Master bathroom has a bathtub, indoor and outdoor shower, and direct access to the pool. The second bedroom is slightly smaller than the Master, but still offers the same views and direct terrace access. The third bedroom is in the back of the villa, and is the same size as the second bedroom. Follow the glass stairway up to the upper level, which overlooks the pool terrace and the sea, to find three more bedrooms. Two of the upper level bedrooms connect to one another and are similar in size, while the third mimics the Master Suite. Like the Master Suite below, this room also has a sitting area, an extra large dressing room, and an ensuite bathroom with a tub. All three bedrooms share the balcony and have stunning ocean views. Each of the six bedrooms has U.S. and French satellite, Apple TV, and BlueTooth stereo that are all controlled with iPads. NEO is in Saint Jean, near the lagoon and the beach. Nikki Beach is nearby, a popular choice for partying and letting loose. Several restaurants are within a short drive, as is the grocery store if guests would rather eat in. pool size 108 ft. x 16 ft., The pool has stairs and an alarm.